The major themes of this meeting were: new properties of heat shock proteins (HSPs) and heat shock factor (HSF) and role in the etiology of cancer, molecular chaperones in aging, extracellular HSPs in inflammation and immunity, role of heat shock and the heat shock response in immunity and cancer, protein aggregation disorders and HSP expression, and Hsp70 in blood cell differentiation. This symposium was the seventh symposium in a series presided over by Dr Stuart Calderwood aimed at exploring the association of molecular chaperones, heat shock proteins, and the heat shock response in physiological/pathological processes. The biochemistry and ultrastructure of molecular chaperones was not emphasized, as these topics are well represented at other meetings. The major themes were: new properties of heat shock proteins (HSPs) and heat shock factor (HSF) and role in the etiology of cancer, molecular chaperones in aging, extracellular HSPs in inflammation and immunity, role of heat shock and the heat shock response in immunity and cancer, protein aggregation disorders and HSP expression, and Hsp70 in blood cell differentiation. This report gives a thematic overview and does not include all the topics presented. One of the exciting aspects of the meeting involved advances made in understanding the biology of Hsp90. In recent years, we have understood the molecular chaperone activities of Hsp90 mostly in terms of its biochemistry, cooperative interactions with cochaperones. However, Dr Len Neckers (NCI/NIH), the conference keynote speaker, has opened up new areas in our understanding of this chaperone by characterizing the role of posttranslational modification (PTM) in terms of phosphorylation, acetylation, and sumoylation in Hsp90 biology. One particularly intriguing possibility is that altered signaling mechanisms characteristic of cancer may target such PTMs, and this could contribute to the “addiction to chaperones” observed in malignant cells. (Also discussed later by Dr Mehdi Mollapour, SUNY Upstate Medical University). In addition, interesting differences in properties of the two Hsp90 isoforms have been detected. Dr Wei Li (University of Southern California) has shown that Hsp90a can be released into the extracellular environment and there take part in cell regulation, mediating for instance wound healing effects. In addition, proteomic studies carried out by Thomas Prince (NCI/NIH) in the Neckers lab indicate that Hsp90β may be more dedicated to “housekeeping” molecular chaperone functions while Hsp90α may play more glamorous roles in cell regulation. These distinctions might not be anticipated based on the rather minimal sequence differences between the Hsp90s but offer keen insights into the biology of this chaperone. Finally, Dr Tim Haystead (Duke University) discussed the approach of targeting ectopically expressed Hsp90 for imaging and treatment. Another PTM with implications in the stress response is the modification of intracellular proteins by monosaccharides of O-linked β-N- acetylglucosamine (O-GlcNAc). Dr Natasha Zachara (Johns Hopkins University School of Medicine) discussed targets for this modification and roles in cytoprotection. The poster session was also rich in Hsp90 studies, mostly from the Neckers lab—presentations by Kristin Beebe et al. (NCI/NIH) Posttranslational modification state of Hsp90 differentially affects binding of small molecule inhibitors; Toshiki Kijima et al. (NCI/NIH), Defined interactions between HSF1 and Hsp90; T. Prince et al. (NCI/NIH) Hsp90 and tyrosine kinase inhibitors: A synergistic approach towards combating cancer; Andrew W. Truman (University of Chicago)Quantitive ptoteomics of the yeast Hsp70/Hsp90 interactomes during DNA damage reveals chaperone–dependent regulation of ribonucleotide reductase. Inhibition of Hsp90 via C–domain induces temporally distinct phosphorylation patterns; and Diana M. Dunn (SUNY Upstate Medical University)Phosphorylation of human Hsp90 threonine 115 modulates chaperone function and drug sensitivity. Hsp70 is also emerging as a factor in cell regulation, exhibiting properties beyond a narrow role in chaperoning. Dr Michael Sherman (Boston University) showed a key role for Hsp72 in mammary cancer, and this property did not seem to depend on alterations in protein folding. Instead, Hsp72 appeared to function through its co-chaperone Bag3, a major regulatory molecule in cell signaling. In addition, a presentation by Stuart Calderwood (Harvard Medical School) that included work by Jianlin Gong showed that Hsp72 is required for tumor initiation and metastasis in murine spontaneous breast cancer. These effects appeared to be partially mediated through regulation of expression of the protoooncogene c–Met, a key player in invasion and metastasis in cancer. We anticipate advances in understanding of the roles of individual members of the Hsp70 family, as is currently emerging for Hsp90. The prospect of targeting Hsp70 with small molecule inhibitors was elegantly discussed by Maureen Murphy (The Wistar Institute), who introduced a novel class of drugs that could selectively kill cancer cells by inhibiting Hsp70 function. In a related topic, Dr Mathias P. Mayer (University of Heidelberg) showed a detailed analysis of the activities of inhibitors targeting various domains in Hsp70. Dr Takanori Eguchi (Harvard Medical School) then described his studies showing an unconventional role for the extracellular protease MMP3 as a nuclear protein that could trigger molecular chaperone synthesis (HspA7) in mammary cancer. Interestingly, a role in cancer for the Hsp70 co-chaperone Hsp40 was also shown by Dr Jane Trepel (NCI/NIH). One presentation that stood apart was that of Dr Carmen Garrido (INSERM U866) who has shown very impressive studies indicating a key role for Hsp70 in hematopoiesis, acting through the factor GATA1. This role appeared to depend on nuclear localization of Hsp70, and Dr Garrido is attempting to study the role of PTM, particularly phosphorylation in this function/localization of Hsp70. This continued the theme of HSP PTM and regulation in the cell. A symposium on molecular chaperones in aging was organized by Dr Shelley Buffenstein (University of Texas Health Science Center San Antonio). This symposium featured some fascinating studies on the naked mole rat (NMR), a rodent with a remarkable lifespan based on size (32 years compared to 3 years in the comparably sized mouse). This has permitted comparative biology studies that have uncovered important aspects of the aging process in mammals. Dr Buffenstein showed that one aspect of the proteotoxic response was enhanced in NMR—proteasome activity that was resistant to oxidative stress as well as conventional proteasome inhibitors. Such proteasome resistance appeared to be conferred by Hsp70 and Hsp40. Karl Rodriguez (also from the UTHSC San Antonio) stressed the importance of Hsp25 in the longevity of NMR. This small HSP is expressed to very high levels in this organism. Kenneth B. Storey (Carleton University) finally gave an encyclopedic presentation entitled “HeatShock Proteins and Hypometabolism in Nature”, discussing the multiple roles of chaperones in hibernation and other processes involving a step down in metabolism. Michael Sherman (Boston University) chaired a lively and highly diverse session on protein aggregation disorders and HSPs. Gary Jones (Maynooth University) discussed his studies on the roles of Hsp104, Hsp70, and Hsp40 in prion propagation in yeast, concentrating on Hsp70. The Hsp complex was able to dissolve prions in yeast. Daniel Kaganovich (Hebrew University) then continued in a yeast theme, discussing a further strategy for resolving proteotoxic stress involving asymmetric cell division in which damaged proteins and mitochondria remain with the mother cell after mitosis. Nava Zaarur (Boston University) then discussed the role of aggresome particles in resolving aggregated proteins, in this case in eucaryotes. Alberto Macario (University of Maryland School of Medicine) discussed the role of chaperonins in proteotoxic disorders dealing with the effects of a pathogenic mutation of human CCT5 on its intrinsic properties. Dr Elaine C. Lee (University of Connecticut) discussed another type of stress. She showed significant roles for chaperones in osmotic stress responses of Caenorhabditis elegans models of polyglutamine diseases. Although it is now generally accepted that HSPs can escape the confines of the cell, many questions still remain regarding their extracellular properties, particularly with regard to their immune effects. These questions include: whether HSPs are mostly immunostimulatory or immunosuppressive, whether they can induce sterile inflammation, and what structures on the immune cells recognize the HSPs. Dr Cristina Bonorino (Pontifícia Universidade Católica do Rio Grande do Sul) chaired a symposium “HSP as modulators of immunity: prokaryotic meets eukaryotic” featuring presentations by Robert Binder (University of Pittsburgh), Eckhart R. Podack (University of Miami), Renata Pasqualini (University of New Mexico Medical School), and Cristina Bonorino. In short, the talks indicated that while the prokaryotic chaperone DNA-PK can be immunosppressive and prolong the lifetime of transplanted tissues and reduce the morbidity of arthritis (Drs Bonorino and Kamal Moudgil (University of Maryland School of Medicine)), HSPs can also be immunostimulatory and act as cancer vaccines when associated with cancer antigens (Drs Binder and Podack). In the discussion, it was stressed that these effects may be related to HSP dose, with low doses of HSP antigen complex favoring immunity while higher doses may lead to immunoregulatory effects (Dr Binder). Most parties agreed that much future study is required to resolve all these issues. It was also suggested, inspired by the presentation of Dr Neckers, that HSP PTMs might also be playing roles in shading the immune effects of HSPs (Dr Bonorino). In the next session, Drs Shawn Wang (Virginia Commonwealth University School of Medicine) and John Subjeck (Roswell Park Cancer Institute) discussed the molecular foundations of their highly effective large HSP vaccines that are now in clinical trial for tumor immunotherapy. They indicated that the high avidity for antigen of the larger HSPs might be key for effectiveness. Although the nature of HSP receptors is still not fully resolved, Ayesha Murshid (Harvard Medical School) made a strong case for the scavenger receptor SREC-I as a key molecule in the effects of HSPs on immune cells. As many of the HSPs are in large families, it has not been clear whether all members of Hsp90 or Hsp70 can function outside the cell. Dr Wei Li (University of Southern California) showed that HSP90 family member Hsp90α is the major secreted factor while Dr John Williams (University of Chester) showed potent extracellular effects for human HSP70 isoform HSPA1A. Extracellular roles are not restricted to Hsp90, and Edward O’Brien (Libin Cardiovascular Institute of Alberta/University of Calgary) discussed the extracellular role of heat shock protein 27 (HSPB1) in inflammatory vascular disease. Another lively issue is whether HSPs are released as free proteins, packaged in exosomes, or whether both forms co-exist. This issue was discussed by Monika Fleshner (University of Colorado) and Antonio De Maio (University of California San Diego). Dr De Maio brought up the interesting scenario of Hsp70 binding directly to lipid membranes and perhaps forming membrane channels (Ryan White, University of Maryland). HSPs are evidently not the only types of stress proteins that can function in the extracellular milieu, as indicated by Dr Michael A. Lynes (University of Connecticut). In a presentation entitled Therapeutic manipulation of the stress response during inflammatory disease, Dr Lynes showed a significant role for extracellular metallothionen in inflammatory bowel disease. Along those lines, Dr George Perdrizet (University of California San Diego) discussed the use of hyperbaric oxygen for enhanced wound healing in diabetic neuropathy, showing impressive clinical findings. The ocular lens assembles two separate Intermediate Filament systems sequentially with differentiation. Canonical 8–11 nm IFs composed of Vimentin are assembled in lens epithelial cells and younger fiber cells, while the fiber cell-specific Beaded Filaments are switched on as fiber cell elongation initiates. Some of the key features of both filament systems are reviewed. Actin filaments and microtubules are essential to the most elemental functions of eukaryotic cells. These filamentous structures are assembled from proteins derived from small, highly conserved gene families. Though tissue specificity exists in the expression of some actin and tubulin family members, they are generally expressed in a ubiquitous manner, and are required for eukaryotic cell survival and replication. In contrast, the family of proteins that comprise the cytoplasmic Intermediate Filaments (IFs) is one of the largest in the human genome with greater than 60 members. IFs are generally not required for cell survival, and are absent from single cell eukaryotes, suggesting a more recent appearance on the evolutionary stage, and a less-essential role in the biology of the cell. The IF family also differs sharply from actins and tubulins in that there is great variation in both size and sequence among the IF proteins, with sequence identity falling below 30% between more distant members of the human IF family. However, despite the large number of IF proteins available for the construction of IFs, any given cell typically expresses only 1–3 IF proteins, with expression tightly restricted to cell type and state of differentiation. This suggests a considerable degree of cell-specific specialization. 1. Predicted domain structure (see figure 1): Algorithms that predict coiled-coil structure show a common predicted domain structure consisting of a) head and tail domains which are quite variable in both size and sequence, and b) a central rod domain where the size (~310 amino acids) and predicted secondary structure is strongly conserved. The rod domain consists of large regions of alpha helical structure (coil domains) interrupted by short non-helical regions (“linkers”) that connect the coil domains. The size, number, and placement of linkers and coils are well-conserved. Moreover, the coil domains exhibit a heptad repeat pattern where the 1, 4 positions in the heptad are dominated by hydrophobic amino acids. Because the 1,4 positions are aligned on one side of the helix, they form a largely hydrophobic “stripe” that runs along one side of the alpha helix. This stripe mediates the dimerization of two matched coil domains. The hydrophobic stripe gently twists around the axis of the helix, giving rise to a supercoiling of two alpha helices, hence the “coiled-coil”. The requisite hydrophobicity at the 1, 4 positions of the heptad can be conferred by any of several amino acids, thus the central rod domain of IF proteins, while showing conserved secondary structure, also exhibits a generally high degree of sequence variation. The exceptions to this are two short motifs found at either end of the central rod domain, commonly called the Helix Initiation Motif (HIM) and the Helix termination Motif (HTM). At these two sites the primary sequence among IF proteins is well conserved. Not surprisingly, the HIM and HTM motifs are intolerant of mutations, with the majority of known IF diseases arising from point mutations in these sites (http://www.interfil.org). 2. Conserved gene structure: Sequence analysis of IF proteins has allowed clustering of IF proteins into several major classes. Sequence conservation in the rod domain is high within a class (typically greater than 70%) but low between classes. Analysis of the IF genes shows that there is conservation of gene structure as well within the IF family, with the number and placement of introns and exons well conserved, especially in the central rod domain. The degree of gene structure conservation correlates well with the degree of primary sequence conservation, and reinforces the grouping of IF proteins into classes on the basis of primary sequence. The Type I and II IF classes are called cytokeratins, and these comprise the IFs of epithelia. These begin assembly as an obligate heterodimer of one Type I and one Type II cytokeratin. The Type III IF proteins include vimentin, desmin, GFAP, and peripherin, and these are commonly found in tissues of mesenchymal origin. While Type III IF proteins can heterodimerize, they are more commonly found as homomeric filaments. The Type IV IF proteins are the neurofilament proteins Heavy (NFH), Medium (NFM) and Light (NFL), which assemble collectively into the IFs of neurons. 3. IF proteins form 8–11 nm diameter IFs. Ultimately, despite the differences in head/ tail size and sequence, and variation in the rod domain sequence, all cytoplasmic IF proteins typically assemble into 8–11 nm IFs. The mechanism by which vimentin is removed as the cell transitions to the organelle-free state is unknown. In cells undergoing mitosis, vimentin IFs are routinely dismantled by phosphorlylation (Inagaki, Nishi et al. 1987), a modification that causes the relatively stable IF polymer break up into smaller subunits, thought to be tetramers. These are subsequently reassembled after cell division is complete. However, vimentin in lens fiber cells appears to removed, and not simply dismantled. IFs are known to be among the first targets of calcium activated proteases (calpains) in cells that are damaged, and many investigators have demonstrated the calcium-activated degradation of both vimentin and BFs in lens(Yoshida, Murachi et al. 1984; Truscott, Marcantonio et al. 1990; Marcantonio and Duncan 1991; Bettelheim, Qin et al. 1995; Andersson, Sjostrand et al. 1996; Sanderson, Marcantonio et al. 1996; Sanderson, Marcantonio et al. 2000). The dismantling of organelles implies a potential release of calcium from organelles in which it is otherwise routinely sequestered. Whether this release occurs, and whether it alters cytoplasmic calcium levels to a degree that would activate those calpains present in the fiber cell is not known. Caspases activated in the apoptotic cascade can target conserved sites in IF proteins(Caulin, Salvesen et al. 1997). The elimination of organelles from the fiber cell represents an incomplete apoptotic event, and thus those enzymes responsible for organelle elimination may also represent a viable mechanism for explanation of vimentin’s suggested disappearance(Oshima 2002; Omary, Coulombe et al. 2004). The loss or reduction of vimentin levels does not leave the mature lens fiber cell devoid of an IF system, however. In a manner that emulates IF switching seen in stratified epithelia, a second generation IF system is switched on in the lens as vimentin is being switched off. It is here where the story of the lens IF system takes the most unusual turn yet described in the IF field. The initial recognition that the mature lens fiber cells departed from the IF dogma was made when Maisel and co-workers noted the presence of “Beaded Chain Filaments” or Beaded Filaments (BFs) in an electron microscopic analysis of chick lens homogenates (Maisel and Perry 1972; Maisel 1977; Bradley and Maisel 1978; Bradley, Ireland et al. 1979). These studies noted a clearly filamentous structure that was distinct from thin filaments, microtubules, and IFs, which at that time were emerging as the universal cytoskeletal structures common to essentially all vertebrate cells. Speculation emerged that these structures were thin filaments with bound alpha crystallin particles, or nucleosomes on DNA, but these explanations were ruled out experimentally (Bloemendal, Berbers et al. 1984; Ireland and Maisel 1984). Consistent with the emerging role of IFAPs in modulating and adapting IF function is the observation that fiber cell vimentin IFs interact with the N Cadherin-gamma catenin complex (Leonard, Chan et al. 2008), lengsin(Wyatt, Gao et al. 2008), MIP(Lindsey Rose, Gourdie et al. 2006), periplakin(Yoon and FitzGerald 2008), tropomodulin(Fischer, Quinlan et al. 2003) and possibly other complexes which are present in lens(Bagchi, Katar et al. 2002; Straub, Boda et al. 2003; Bagchi, Katar et al. 2004). The number of candidate linker proteins demonstrated in lens leads to the expectation that the BF and IF are likely to accomplish multiple functions, and that these may be modulated as differentiation progresses, and as the fiber cell proteome changes, either by expression or proteolysis. Similarly, the small heat shock proteins, whose chaperone function appears essential to IF/BF assembly and maintenance, must be considered as critical parts of the biology of IFs in lens. Mutations in the small heat shock proteins have been shown to precipitate a failure in the IF systems in many tissues, and in lens specifically, and to subsequently emulate IF diseases (FitzGerald and Graham 1991; Nicholl and Quinlan 1994; Carter, Hutcheson et al. 1995; Vicart, Caron et al. 1998; Muchowski, Valdez et al. 1999; Perng, Cairns et al. 1999; Perng, Muchowski et al. 1999; Evgrafov, Mersiyanova et al. 2004; Treweek, Rekas et al. 2005; Song, Hanson et al. 2008). The growing multiplicity of IF interactions underscores the need to expect that failure in “IF function” in the lens can result from failure in a wide spectrum of proteins that affect assembly, phosphorylation, proteolytic modification, stability, removal, or linkage to other cellular structures, and that “IF failure” is likely to show considerable variability in phenotype. Background: One approach to resolving some of the in vivo functions of alpha-crystallin is to generate animal models where one or both of the alpha-crystallin gene products have been eliminated. In the single alpha-crystallin knockout mice, the remaining alpha-crystallin may fully or partially compensate for some of the functions of the missing protein, especially in the lens, where both alphaA and alphaB are normally expressed at high levels. The purpose of this study was to characterize gross lenticular morphology in normal mice and mice with the targeted disruption of alphaA- and alphaB-crystallin genes (alphaA/BKO). Methods: Lenses from 129SvEvTac mice and alphaA/BKO mice were examined by standard scanning electron microscopy and confocal microscopy methodologies. Results: Equatorial and axial (sagittal) dimensions of lenses for alphaA/BKO mice were significantly smaller than age-matched wild type lenses. 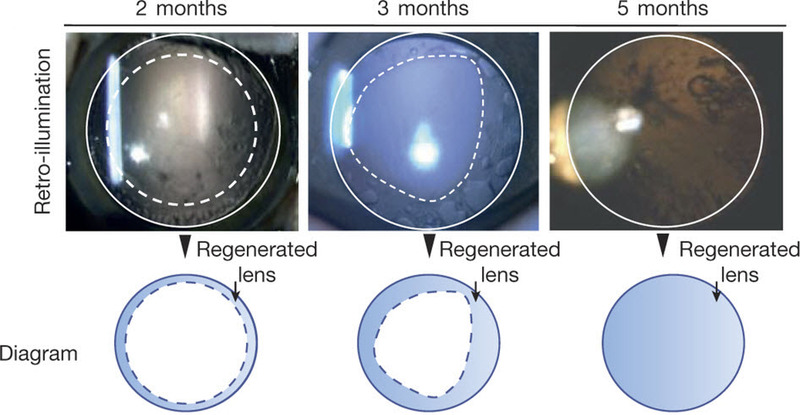 No posterior sutures or fiber cells extending to the posterior capsule of the lens were found in alphaA/BKO lenses. Ectopical nucleic acid staining was observed in the posterior subcapsular region of 5 wk and anterior subcapsular cortex of 54 wk alphaA/BKO lenses. Gross morphological differences were also observed in the equatorial/bow, posterior and anterior regions of lenses from alphaA/BKO mice as compared to wild mice. Conclusion: These results indicated that both alphaA- and alphaB-crystallin are necessary for proper fiber cell formation, and that the absence of alpha-crystallin can lead to cataract formation. The amino acid sequences of the a-crystallin A and B chains of the dogfish, Squalus acanthias, have been determined. Comparison with a-crystallins from other species reveals that charged amino acid replacements have been strongly avoided in the evolution of this lens protein. The homology of a-crystallins with the small heat shock proteins is pronounced throughout the major part of the proteins, starting from the position of the first intron in the a-crystallin genes, but is also detectable in the amino-terminal sequences of human, Xenopus, and Drosophila small heat shock proteins. In addition, a remarkable short sequence similarity is present only in the amino termini of dogfish aB and Drosophila HSP22. The Schistosoma egg antigen p40 turns out to have a tandomly repeated region of homology with the common sequence domain of a-crystallins and small heat shock proteins. Comparison of hydropathy profiles indicates the conservation of conformation of the common domains in these three families of proteins. Construction of phylogenetic trees suggests that the aA and aB genes apparently originated from a single ancestral small heat shock protein gene and indicates that introns have been lost during the evolution of the heat shock protein.